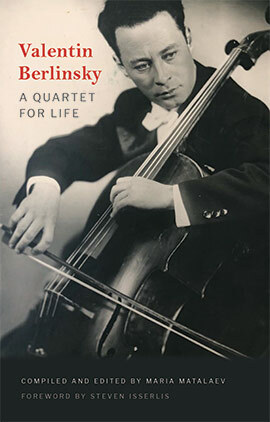 When first invited to write a foreword to the English version of this biography of Valentin Berlinsky, I refused (politely). After all, I met him only once, in Greece in 2003; it was a very brief encounter – though I remember how charming he was during our short conversation. Also, I have never played in a regular string quartet, so am perhaps not the right person to appreciate his historic importance as an ensemble player. But afterwards, reading the book, I began to regret my refusal. The more I read, the more absorbed and touched I was. Today we consider – with good reason - the later Stalin years in Russia as a time of repression, of sinister paranoia, of endless suffering. We can forget, however, how much great music and how many wonderful musicians managed to survive those perilous times - albeit with difficulty, and with the necessary aid of much personal/political skill. These were years during which the Russian musical landscape was populated by such giants as Prokofiev, Shostakovich and Mravinsky; and in which, despite all the pressures and perils surrounding them, the blazing young (or youngish) performing talents who emerged included Gilels, Richter, Kogan, Shafran, Rostropovich, Svetlanov, Rozhdestvensky – and the Borodin Quartet. The Quartet is our main duty… members of the Quartet have equal rights… any problems must be presented to and resolved by the four members of the Quartet…The members of the Quartet must maintain relations that are based on mutual respect and trust. Behaviour outside the quartet must be governed by pride in the honour of belonging to the Quartet. Who could ask for a declaration purer than that? No wonder that the quartet became celebrated the world over, famed for their warmth of sound, precision and commitment. Their success was particularly important since, although so many great composers, soloists and conductors had emerged from the Soviet Union, it had not hitherto been known for its chamber music groups. The Borodins transformed that perception; and they also, through their famous and boldly innovative Shostakovich cycles, considerably enhanced the reputation of Shostakovich's music around the world. That seems to have been the creed that sustained him through 64 momentous years as a member of this 'legendary' quartet. It is an astonishing and unique achievement, which is movingly celebrated, both in his own words and in the words of those who loved him in this very special book.